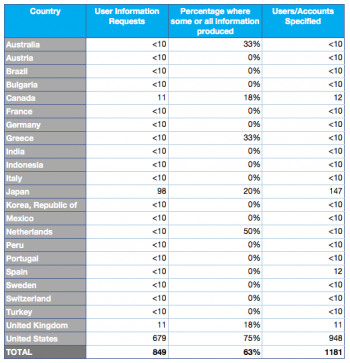 Twitter has published its first Transparency Report, showing you which governments want your user information. In honor of the 4th of July, Twitter has decided to produce its first Transparency Report. The Report - designed much like Google's own publicly accessible database - shows Twitter users how many user information requests each country makes, how many removal requests, and how many of each are granted. American Twitter users should pay close attention, as Uncle Sam is by far the most aggressive seeker after data. Twitter's information stretches back over the last six months - from 1st January to 30th June - and their chart shows that most countries make 10 or fewer user information requests. Japan is a little nosier, and made 98 requests over the period. However its activity level is bush league compared to the demands of the US Federal Government, which has made 679 requests in the last six months alone. About 75% of those requests - affecting 948 individual accounts - were granted. Bear in mind, there have been only 849 requests total according to Twitter's data. That means that the US requests make up almost 80% of the world's user information demands. Twitter intends to keep publishing Transparency Reports every six months. It is probably no coincidence that Twitter compiled and published this chart now, as the Occupy Wall Street protest cases are coming to judgement. Issues of privacy are at the heart of those cases, but so far the courts have been ruling against the defendants and allowing the seizure of tweets.